Cotton or cotton lawn. 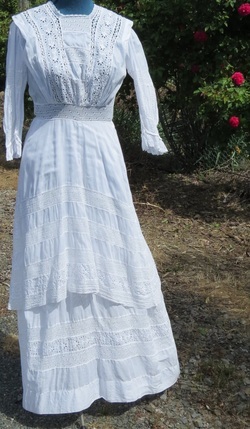 Edwardian dresses should be loose around the bust. Ecot19 S-M B 92, W 66, length 144cm. Sheer cotton lawn and lace. High-low overskirt. Very white. $200. Ecot12 B 91, W 68cm. Sheer lace. $200. Ecot18 Cream. B 86, W71. length 137cm. $200.